It can sometimes seem pointless to try to preserve documents that have to be stored in an industrial setting. Fortunately, C-Line has created a durable holder that can withstand rough environments, while also providing protection to the pages stored inside. The Neon Green Stitched Shop Ticket Holders let you color code important paperwork. Works great for organizing work by department, day-of-week or importance. 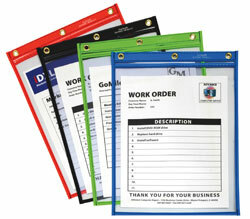 The bright green stitched edging makes work orders or inventory sheets stand out while they are being stored. Sturdy, clear vinyl construction allows for easy visibility of documents and stitched seams ensure long-lasting utility. Convenient eyelet for hanging. Individual colors are packed 15 eaches per box and prices shown are per box. Please order by the box. Green. 9 x 12. Learn about the wide variety of shop ticket holders at C-Line..